is that a drip pipe going by it? [soil might just collapse away from the pipe when the water runs] what size is it? if it is less than 2 inches then it could be mouse/vole/or rat. if greater then it could be a rabbit. 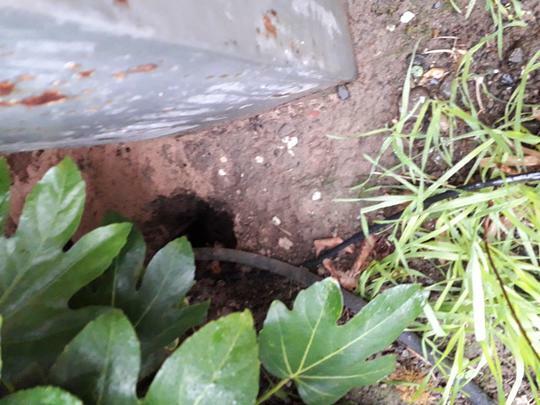 Thanks SBG that's a soaker hose pipe that goes around the garden, the hole is about 8ins wide, the oh has filled it in twice, and it's back again I'm hoping it's not rats! We have 2 cats and can't figure out what is causing it. that size suggests rabbits. rats tend not to have such big burrows. have a look around the garden for sign of droppings. rabbit's is about 1/4" diam and almost round.